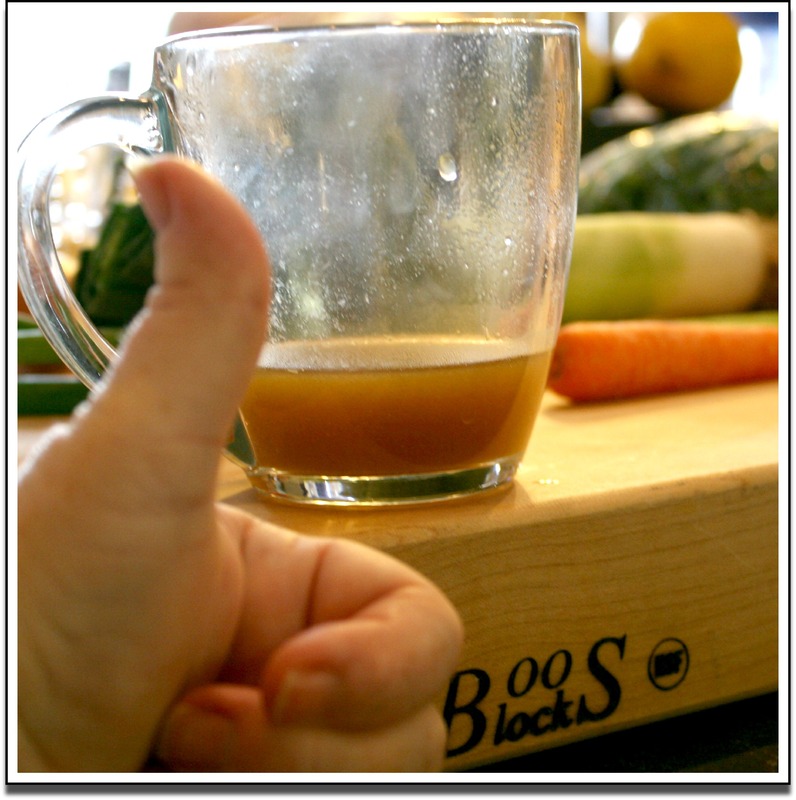 I make small batches of Chicken Stock several times a month with a few left-over Chicken pieces and some veggies. Every few months, I make a Big Batch! Here’s how I made THIS batch. (the recipe is changable). 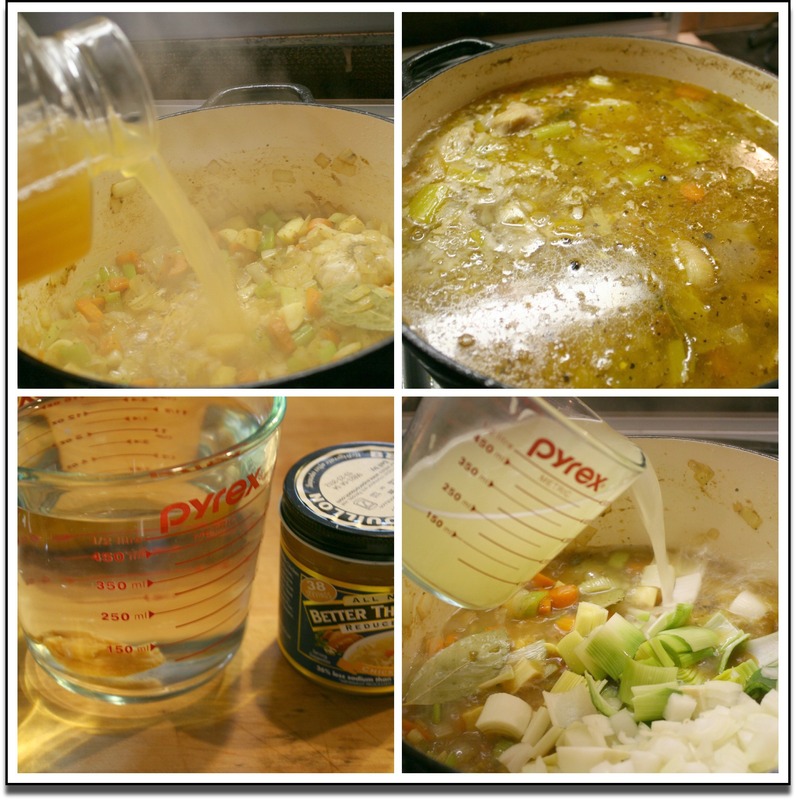 Not a pretty picture, but the truth is you can’t make Chicken Stock without some Chicken! of adding non-potable water) for many reasons, but mostly because they are “local”. 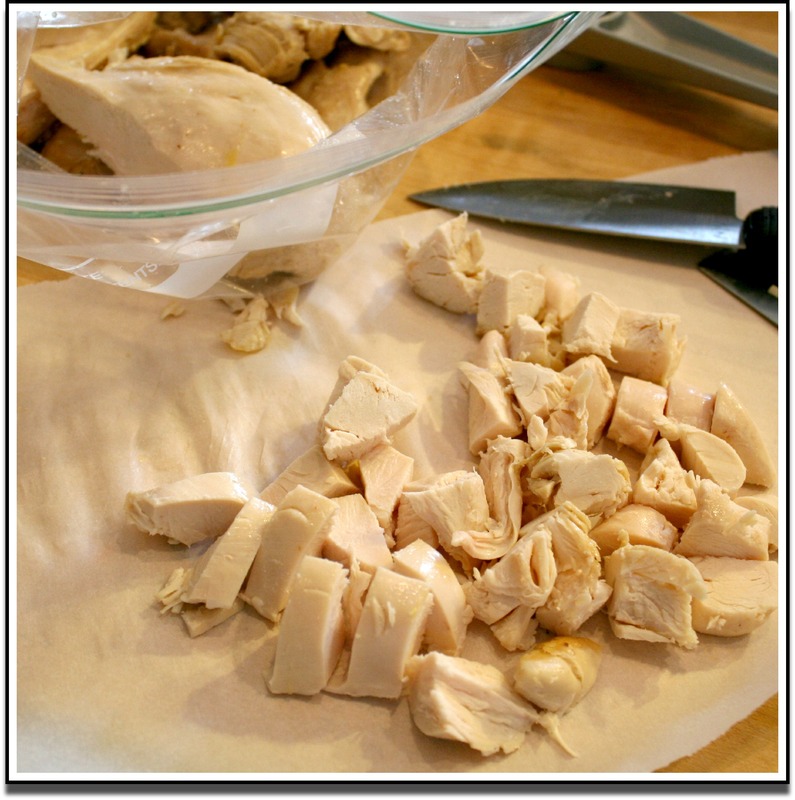 Some recipes call for you to simply boil the chicken in water with spices. 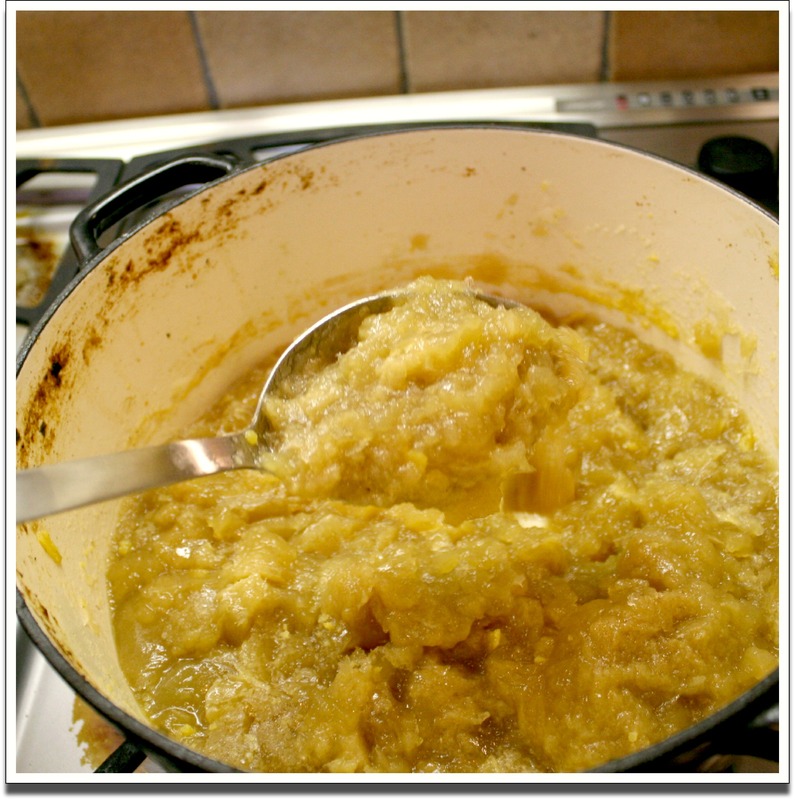 I Kick-Up my Chicken Stock by browning the pieces in the pot and removing them when browned and slightly rendered. I use that rendered fat to brown the Vegetables. 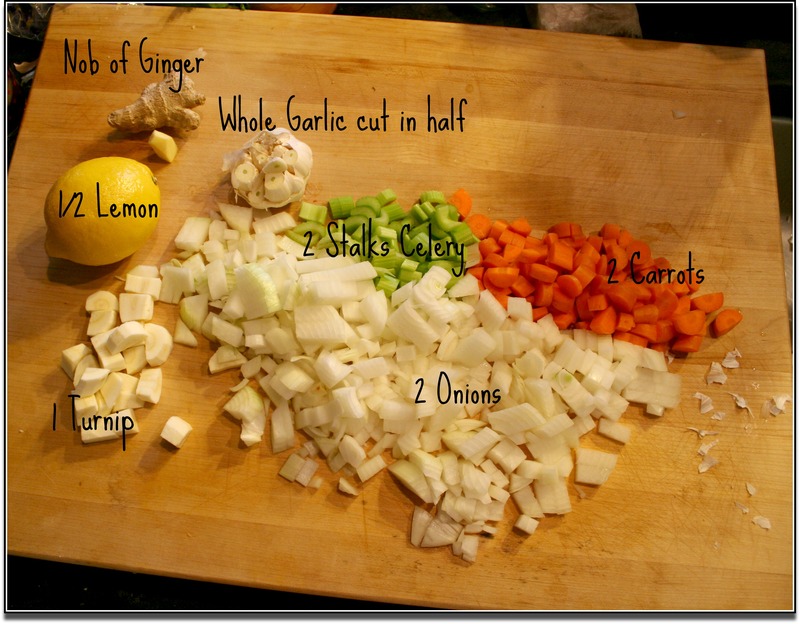 I put these veggies in the pot and browned them until they had a spot of color and were softer. 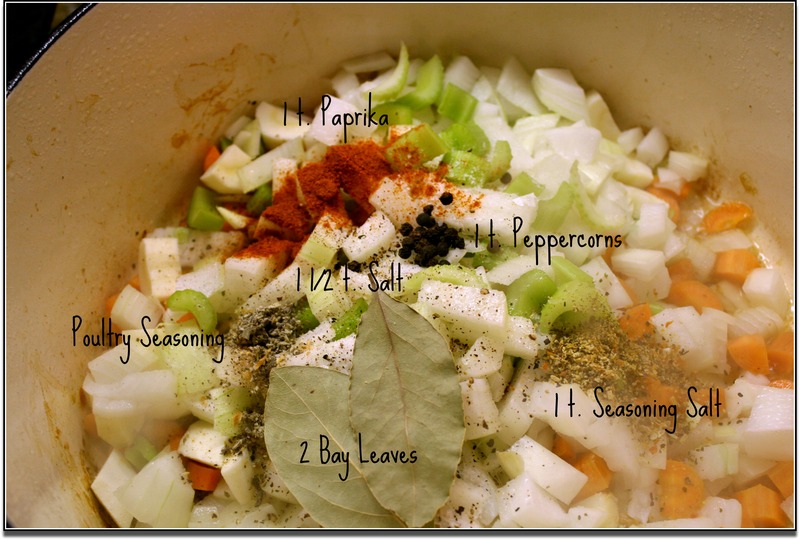 I also add these spices right away so they get browned, too! Next comes the important Liquid. 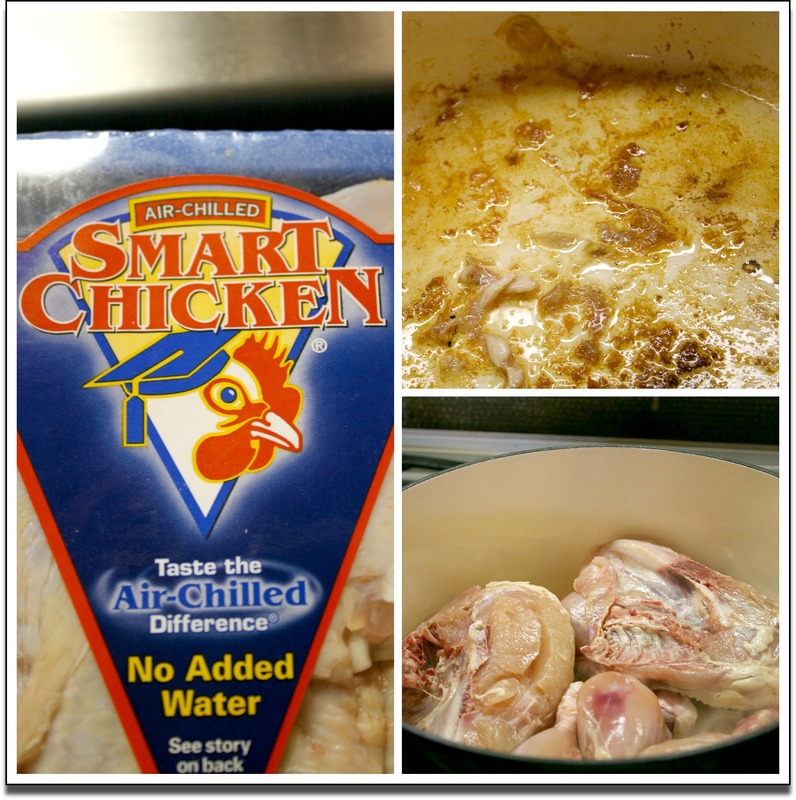 I use a combination of Better than Bouillon Chicken and Water….Maybe a 1-4 Ratio. And don’t forget to add the Chicken Pieces! I used 2 Breasts, 4 Thighs and a package of Legs and Wings. I watched the Large Pieces and took them out when they were cooked and cut the meat off. (I cut that meat, bagged it & froze it.) Then I put those bones back in. I left the Legs and Wings in there and let them cook until the meat came off the bone. One change I made THIS time was to add some Greens. I used a bag of Frozen to make it easy. (I used the Mixed Bag. Next time, I’ll try Spinach.) I used the Greens in the Vegetable Stock, so I thought I’d try it in the Chicken Stock. 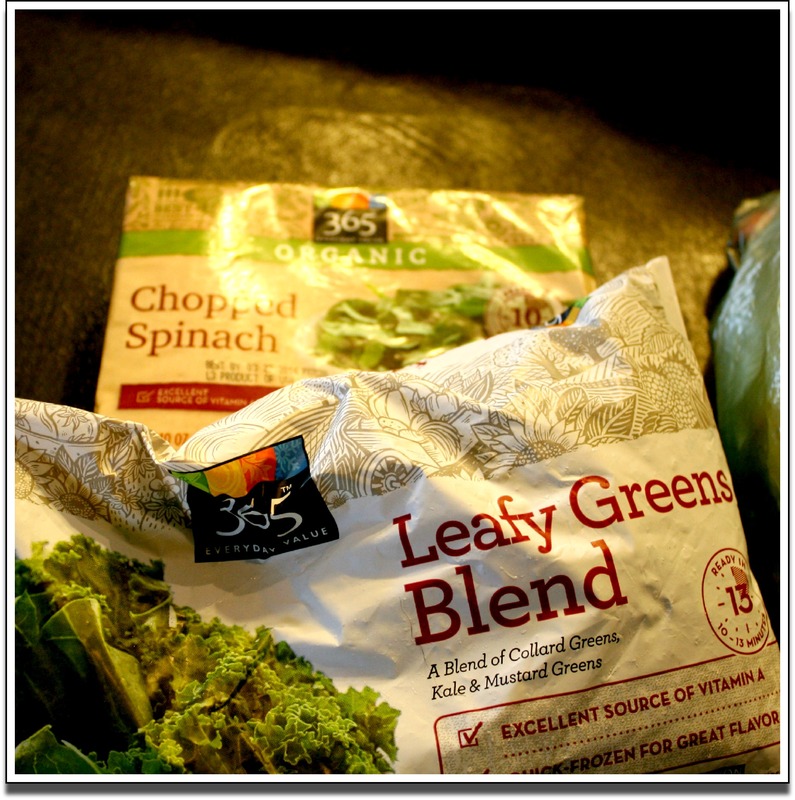 I haven’t seen adding Greens in any recipes……and I started to worry about the flavor. I worried so much that I took the Greens OUT after about an hour or two. The Stock was Out. Of. This. World. 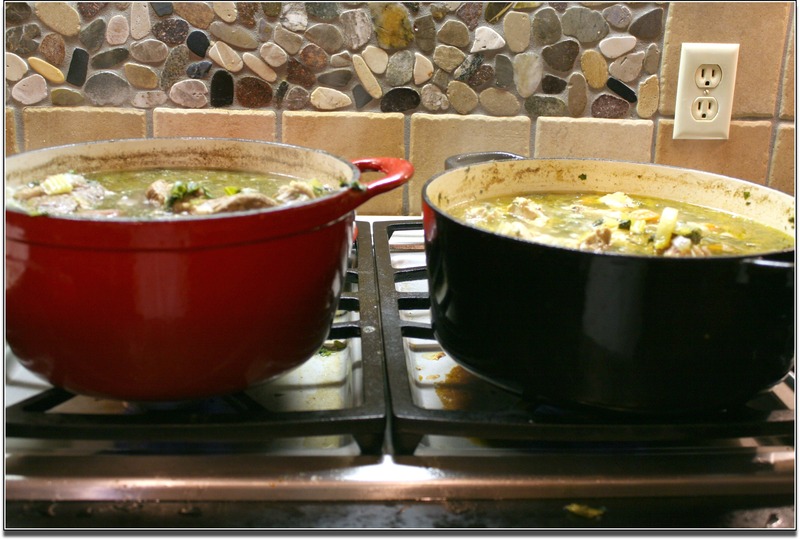 I let those soups simmer on my cooktop for hours. 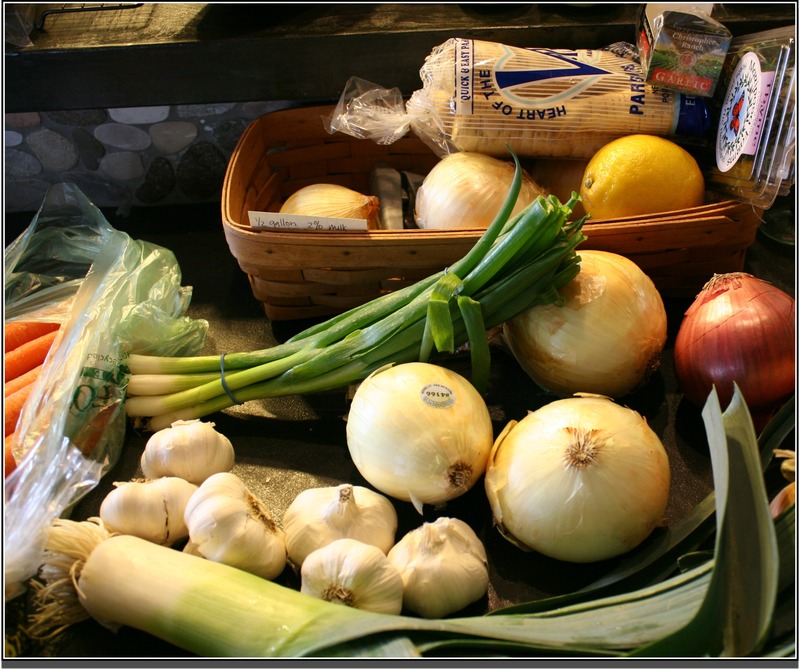 And they developed flavor and character and took nutrients from the chicken and bones and vegetables and make a Delicious Stock. I removed the bones and Vegetables and strained the stock and then put it outside in the cold winter air to separate. 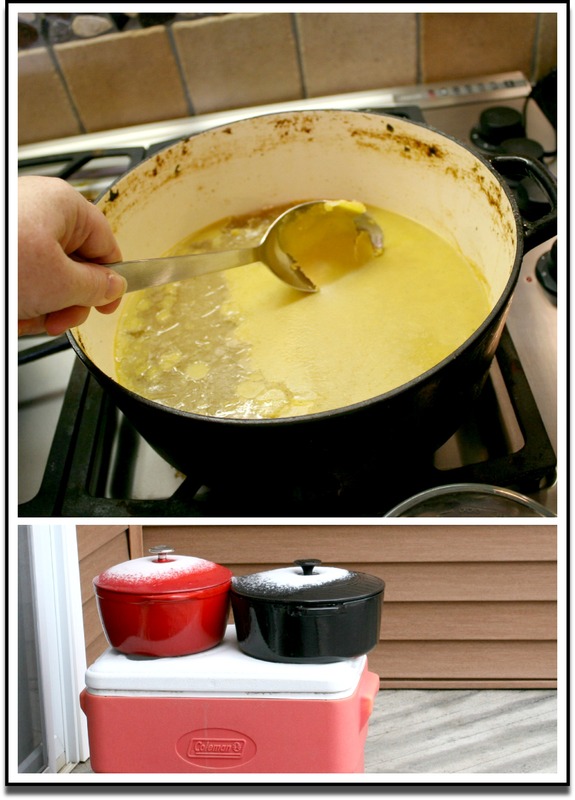 Skim off the chicken fat and save it if you want. I used mine in a Matzo Ball Soup Recipe. (You can freeze it.) I want to share this photo because it scared me when I first started making my own Chicken Stock. It becomes almost JELLED. Thick and Jelly-Like. That is the collagen from the bones. This is what we want to happen! Be happy with the Jell. Then just Save that Stock! I freeze it in 2 cup portions in Ziplock Freezer Bags. It is also fun to put it in a cute jar….like these Weck jars! 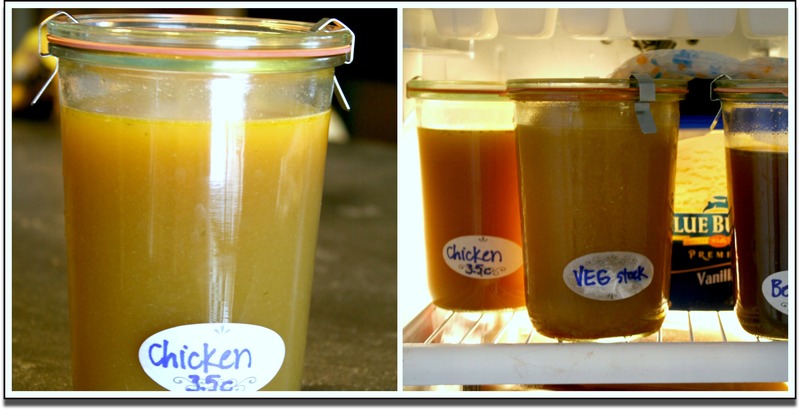 Make your own Chicken Stock. It doesn’t take much time. Really. And it is SO much better to cook with REAL Chicken Stock.